Dog Intestinal Cancer, Deadly, and Torturous? My 5 year old female Akita has been diagnosed with intestinal cancer, a tennis ball-sized tumor in her middle intestine. Prognosis is not good at all. She is now on steroidal tablets to buy us some time. She's responding well, she has started eating again, she's playing & seems happy. She is my life. She is my perfect baby. She is so young. The last thing I want is for her to suffer. Is she in pain? If the medication stops working before the cancer kills her, will she be in pain, or just as before she was so nauseous that she went off food completely hence no energy? When the cancer finally grows to a size where there's a total bowel obstruction, will she be in pain, or just vomiting & bad nausea? We are so sorry to hear about your dog's canine intestinal cancer. It is always very hard to hear and witness such a prognosis for your pet. In this case, the prognosis is not good. The only thing one can do is to improve the quality of for your poor patient. This can be done several ways, by using medications such as specific anti–inflammatory drugs, steroids etc. These drugs reduce the effects of uncontrollably growing cancerous tissues, obviously and unfortunately pain is one of the symptoms a patient may experience. For tumors in the intestine, there are some other concerns as well, such as an obstruction, bloat and possible abdominal distention that can cause severe pain and nausea. Unfortunately, abdominal pain is one of the vital symptoms for intestinal cancers/tumors. It seems that your pet is feeling good under the prescribed steroids along with some other supportive measures you have been directed to follow. Remember however, that you should watch for any side effects that could be the result of the types of drugs you are using. The best approach is to just take very good care of your dog and watch for changes in behavior that would indicate pain. You might also want to try some natural preparations such as C-Caps Formula. These will help to reduce any adverse effects of the steroids you are administering and will help your dog maintain cellular strength. Best wishes for the time you and your dog have together. Join in and write your own page! It's easy to do. How? Simply click here to return to Cancer. Nugget...we love and miss you buddy. 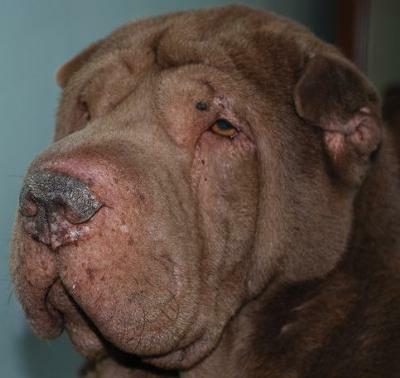 We just lost our 9 year old Shar-Pei on April 4, 2011 to intestinal cancer. His symptoms started on Friday, April 1, 2011. He vomited his evening meal and then started with a fever and tremors. He was acting very confused and lethargic. We got him into the vet first thing on Saturday, April 2, 2011. They did a CBC, rectal exam, and palpated his abdomen. The blood work came back fine (liver, kidney, white blood cells, red blood cells, etc.). He had a fever of 103 degrees. The vet thought that he had an infection of some sort, and put him on antibiotics. By Saturday evening, we were rushing him to an emergency vet clinic. The tremors were worse, he was very lethargic, did not want food/water all day, stumbling, labored breathing. They did x-rays to rule out a bowel obstruction. His fever was 105 degrees. It was thought that he had an infection as well. He was given an IV, an injection for vomiting, and an injection of antibiotic and sent home. By Sunday evening, April 3, 2011, he had yellow stuff coming out of his nose/mouth. He wasn't vomiting, as he had no energy to do so. He drank that day, but still wasn't acting normal. We called the vet and got him an appointment for Monday, April 4, 2011. The vet once again did CBC, heartworm, and lyme disease blood work. All the blood work once again came back normal. The vet suggested that maybe either his gall bladder burst or he may have intestinal cancer. He was in pain when the vet palpated his stomach area. An ultrasound was done. It was found that he had abdominal fluid (ascites), bladder mass, intestinal mass (diffused). His breathing was so labored and all his organs were pushed down towards his pelvis. We made the humane decision as his parents, to put him out of his suffering. We love and miss our boy, Nugget.